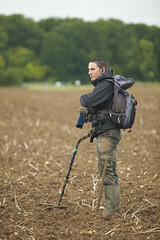 We all know that researching our finds is an important part of the metal detecting process. How many of us have felt we have no real interest in something – that is until we actually come across an example of it. A few years back, for example, I found a lovely medieval spoon and for ages afterwards I was looking up a whole range of information to get a better idea of what I had found – and it hasn’t stopped there of course, far from it! One of the most awe-inspiring finds that I like to make on Roman sites are brooches. I don’t think a metal detectorist ever forgets their first Roman brooch. Most are just plain with slight decoration on them perhaps just an incised line or moulded bump. Some however are amazing with bright enamels and tinning as if made a few days ago.